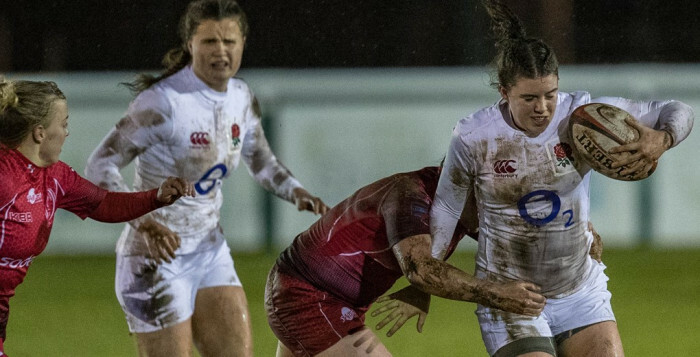 England Women Under 20s ran in eight tries in an emphatic 44-0 win over the the Army at Army Rugby Stadium in Aldershot to record their biggest ever win in the series. In their first match of 2018, Jo Yapp's side to withstand driving rain and wind throughout the game which made playing conditions difficult. The breakthrough came on seven minutes as wing Brooke Clarke broke away and sprinted around the outside, with centre Phoebe Murray's powerful run shortly after seeing her score on her debut. Clarke's second was set up by some neat play by scrum half Tazmin Bricknell, before prop Ellena Perry spotted a gap in the defence to power through. Fly half Helena Rowland's well weighted grubber allowed wing Lilian Stoeger-Goddard, another debutant, to dot down as she gathered the wet ball smartly. Worcester Valkyries wing Clarke got her hat-trick after 31 minutes with another neat finish and that was the end of the scoring in the first 40 as England led 30-0 at the break. Despite the difficult playing conditions, England produced some neat handling moves throughout but ti was another midfield that break saw Murray slide over for her second of the match. Michaella Roberts grabbed the final try when the ball was zipped through hands and she sprinted in for a 30 metre finish with arguably the try of the game. Jo Yapp handed 13 players their England U20 debuts on the night, including six players from the start in Lillian Stoegar-Goddard, Phoebe Murray, Helena Rowland, Tazmin Bricknell, Tabitha Copson and Sarah Beckett. Hannah Botterman, Akina Gondwe, Connie Powell, Rianna Manson, Cara Brincat, Emma Hardy and Lizzie Adam also came on as replacements to make their first appearances at this level. All of the players have been part of the inaugural Tyrrells Premier 15s season, impressing at their clubs to be given their chance at international level. England Under 20s head coach Jo Yapp: "We are really proud of the girls as those were difficult conditions to play in and in that first half we looked after the ball and tactically we put the ball in the right places. "We were really happy to not allow them to cross, that was our goal at half-time, we wanted to keep them at nil and the girls did that. "Brooke was really clinical, she's got so much talent and it was great to see her get her hands on the ball this evening. "There are lots of things to work on but on the whole it's a really positive start." 15. Emma Uren ©, 14. Lilian Stoeger-Goddard, 13. Phoebe Murray, 12. Lucy Attwood, 11. Brooke Clarke, 10. Helena Rowland, 9. Tazmin Bricknell; 1. Ellena Perry, 2. Leah Bartlett, 3. Ellie Mulhearn, 4. Hollie Cunningham, 5. Rosie Galligan, 6. Tabitha Copson, 7. Charlie Wilcock, 8. Sarah Beckett. 16. Michaella Roberts, 17. Hannah Botterman, 18. Akina Gondwe, 19. Connie Powell, 20. Rianna Manson, 21. Cara Brincat, 22. Ella Wyrwas, 23. Emma Hardy, 24. Lizzie Adam.